It is a murky, grey day towards the end of Setpember 2010. I cannot see blue sky but I am not sure whether it is a sheet of cloud or mass of drizzle above my head. It was about mid-day when I went to the hive. Fine drizzle, quite cold so imagine my surprise when I saw, excuse the pun, a hive of activity. There were masses of bees around the entrance and having watched a video of bees getting ready to swarm, it was reminiscent of that. But they were mainly facing the hive and there were still many bees entering carrying pollen. Perhaps this is the day the drones are expelled? I wondered whether I’d see any on the floor – not really, an odd one or two perhaps but nothing unusual. I took a couple of still pictures which I can upload here and a couple of videos I can host elsewhere. 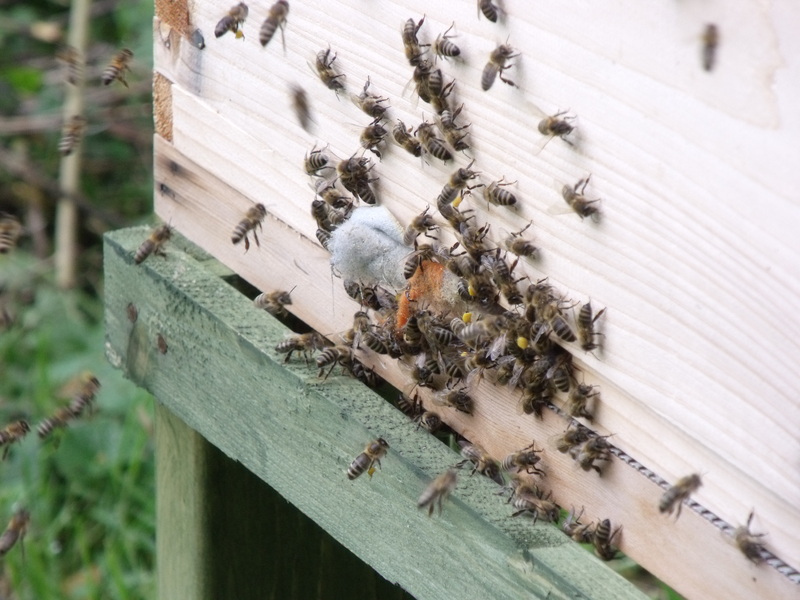 Another surprise is that there is still so much pollen coming into the hive. The queen should stop laying or reduce for the winter. The activity is not confined to the hive entrance. The sky above is also typical of a much warmer summer day – bees who seem either to rise from the hive and get their bearings from a few straight line sweeps of the air above or who, on their return, make almost a square spiral of movement down into the hive. As I watched, coincidentally or not, there was suddenly what looked a much larger bee going across the hive and away to the South East. It did not hesitate near the hive so possibly has no connection to the sense of alarm or at least heightened excitement, but my mind thinks ‘hornet’ and remembers a video I saw on you tube of a hive destroyed by hornets. I get some comfort from how thriving my colony appears – with this many outside the hive surely those who pass would not tackle what could be a relentless army. When I awoke this morning, I saw what appeared to be bees flying across the roof by the bedroom. From the balcony I could see their focus seemed to be just behind a corner of the window. What an irony if we now have been that have taken residence. They couldn’t be some of my colony, could they? I guess the best thing is to leave them for now and then see if they survive the winter. PS: No, they did not survive teh cold winter of 2010/2011.